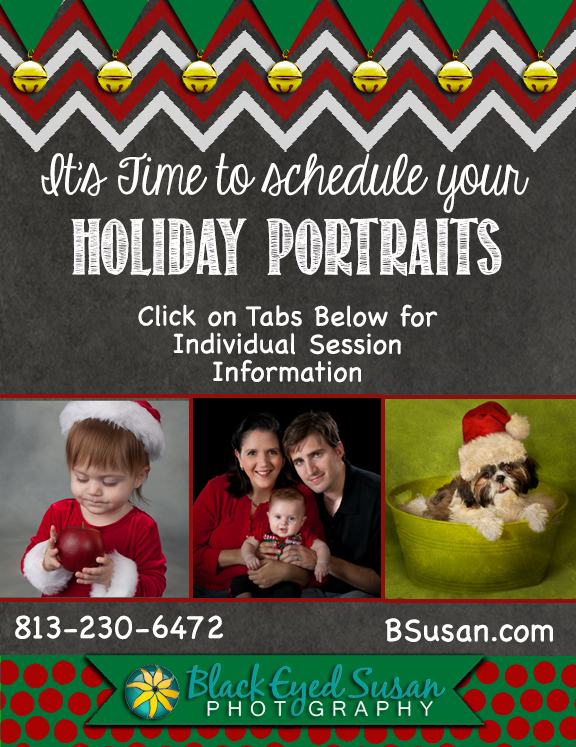 Black Eyed Susan Photography announces our 2013 Holiday Sessions. This year we are adding something extra special to your session…a 5×7 Holiday Card template that you can use any way you’d like. Your card template will include your choice of image/s depending on the session you select. We have tons of different designs and styles to select from. Our Holiday Card designs are the perfect compliment for your session photograph. Card template and photograph/s are downloadable to your computer. They arrive ready to send to your favorite printing source. Our card templates also make great e-cards for the on-line enthusiast. We’ve designed the perfect way to send Holiday greetings to your friends and family that’s sure to match any budget! Coming soon…ready made downloadable templates for the “do it yourself” photo enthusiast or hobbyist. To see each session special, click below on the session.